If you want to save money at home, roll out more insulation in your attic to save energy. Switch incandescent bulbs with LED lighting. Change your furnace filter, repair that leaky sink, seal up drafty windows and paint the children’s room yourself. But don’t climb onto your roof and try a DIY roofing repair. Here are three great reasons why. 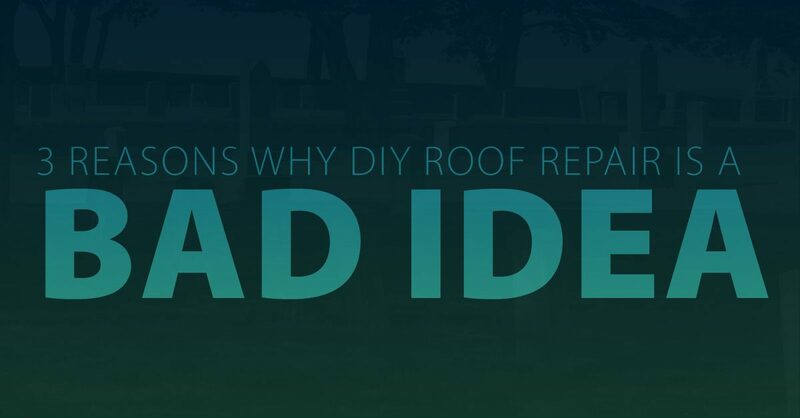 The truth is, roof repairs are not DIY projects. There’s simply too much at stake. In fact, the only way you are going to save money on a DIY roofing repair is if you seal it 100% watertight, don’t waste money on wrong materials and tools, don’t void your warranty, don’t get injured and don’t create a future repair problem in the process. A roof repair isn’t a DIY project like replacing windows, repairing a burst pipe or even flushing out your water heater. Those DIY repairs are right in front of you. Do you even know where the roof leak is located? If you want your roof to be watertight and last through the years, save money and hassle by calling your trusted roofing contractor. A good NASCAR pit crew can change four tires and refuel a car in 12 seconds. How fast can you do the same to your own car? This analogy isn’t a stretch at all. It takes time and skill to do a roofing repair correctly and safely. If you do undertake a roof repair yourself, just make sure you know how to cover up a job in progress if the weather changes. When it rains during roof repairs, it pours. Save Your Life — Roofing Is Dangerous! Roofing is consistently ranked as one of the most dangerous jobs in America. One of the reasons is that working from elevated heights on a sloped surface is part of the job description. It’s one thing to bump your head beneath the kitchen sink while fixing a leak. It’s quite another to stumble or slip on your roof from two stories up. Moreover, it’s very easy to experience heat exhaustion on your roof and under it inside your attic — another dangerous space that typically requires access for roof repairs. For the safest and most successful results, don’t attempt DIY roofing repairs. Just call Victors Roofing in Southeast Michigan today for friendly service and a free estimate! Check Out Our Residential Roofing Options!